In today's world technology gets more advanced and there is a constant shift to make better and more devices. Every company has something to offer consumers - some products are better than others and the price range varies so that most consumers can afford tech products. Recently Samsung has sent us the Samsung Galaxy 7.0 Tablet for us to review here at BCCHardware and this fits in to the tablet market that is pretty affordable - but not budget. Of course most of you have heard of Samsung - a South Korean Company in "Samsung Town", Seoul that have branched out to many parts of the world and made many products over the years of product production. From appliances, to TV’s, computers, laptops, point and shoot cameras, head gear to phones and now tablets - Samsung makes a ton of different products. They want to produce products that “take the world to imaginative new directions.” I think the Samsung Galaxy 7.0 Tablet fits right in with their product line for mainstream affordable technology. This is a 7" tablet that fits nicely in between their 10" tablets and the 5.3" Galaxy Note as we'll see in a bit. Although some of the staff here at BCCHardware own tablets, this will be the first one we actually review. We've looked at touch screen media players, but nothing like this. 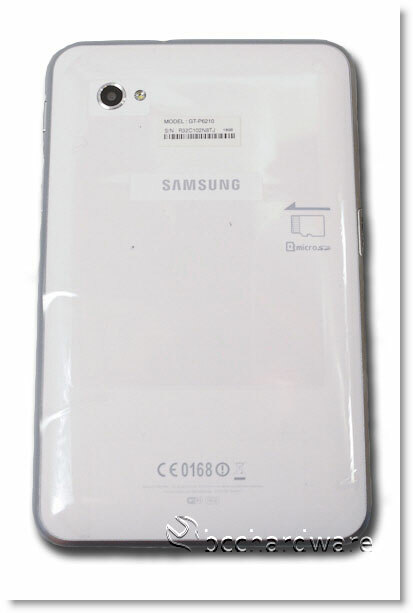 Although in reference BCCHardware did take a look at the Galaxy Note recently. While not a full-on tablet, it still qualifies as a phone/tablet = phablet. For those of you that are Android fanboys and fangirls, the Samsung Galaxy Tablet runs Honeycomb 3.2. We have the 16GB version on our bench, but if you need more you can insert a microSD card as it has a slot for that on the side. The tablet claims up to 8 hrs of battery usage - mind you the more you use it the less battery life (and intense applications and games will make it drain faster). The display is a 7.0" unit and it weighs in at 12.1 oz light and 0.39” thin with a dual core processor. White backing and silver grey metallic look for edging. Touch screen that tends to leave fingerprints behind with its glossy look, front and back facing camera, 2 holes on top and bottom for that are a mic, built in speakers, microSD card slot, volume button, power button on the side and a headphone jack on top and a charging connector on the bottom. On the next page we'll start to get into things by sharing our first thoughts as we break this in and start to use it. Pretty much every tablet out there these days have security so your siblings, nosy friends or a tablet thief can't access or erase your personal data. While the Galaxy Tab 7.0 Plus comes in 3G+WiFi and WiFi variants, we have the WiFi version and you can browse the internet and check email, social networks, YouTube and search to your hearts content - if you are connected to a WiFi network. The tablet is also able to play music, video, record video and take pictures as well as screenshots! The ability to take screenshots is awesome for something like App Pick of the Week and if you want to save something cool for later! Also, you're able to write or scribble on the screenshot if you wanted to make a note about something or point something out. You can even use it as an eBook reader if you're quite the bookworm. The Galaxy Tablet has five home screens to put apps and widgets on as you swipe through. With that being said, the tablet has a "My Apps" spot in the app library section. 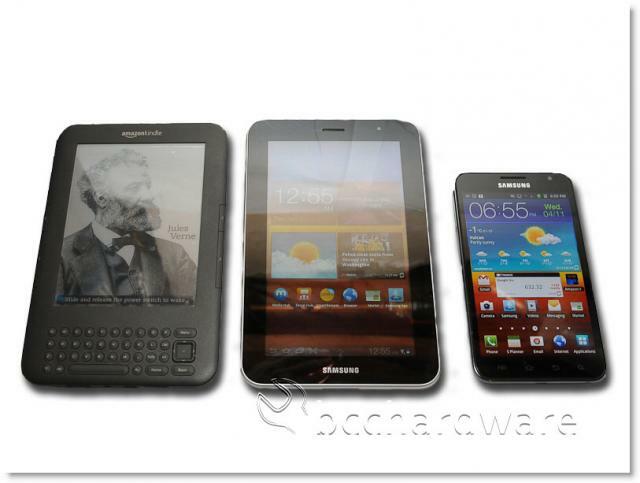 As you can see in the picture below that the Samsung Galaxy Tablet 7.0 is about the same size as a 3rd Generation Kindle and bigger than the Note. The default search engine is Google (obviously) and Samsung keeps search front and center on this device. The Google search bar floats on top and always stays on all the home screens that you can put widgets and apps on. The social networks such as twitter and Facebook are in one column called the social hub. This is a nice straightforward method of displaying information from multiple feeds and it is the same on the Galaxy S II and the Galaxy Note. The type of social network will appear on the post in the right hand corner. I've also included some screenshots of video playback so you can see how clear and well this works. On the next page we'll cover the specifications from Samsung before we jump into testing. Installation can be sometimes either easy or hard, but with the Samsung Galaxy Tablet it was pretty simple for the most part. I had to install... hmm nothing! I opened the box and inside was the Galaxy Tablet, a USB cord that can be used for charging or transferring data also came with a wall outlet plug if you don’t want to charge it through your computer. It's not super long so you'll have to pick your plugins carefully or find a close enough table to a plug when charging, but not too bad still. It came with some ear-bud headphones as well as owners manuals. I started by doing a factory wipe to clear other info and some apps that a previous reviewer had installed on it. Always make sure to do a factory reset on a tablet before you send it back or sell it to someone else! 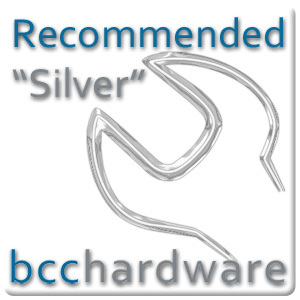 When one of us here at BCCHardware gets a hold of a product you can't help but notice that your fingers have eyes and want to "see" how it works. As the phrase goes "can i see that?" translates to "can I hold that in my hands and play around with it?" The favorite time with any product is the testing that can lead to getting carried away playing sometimes. The Samsung Galaxy Tab 7.0 Plus is a pretty neat tablet indeed. I never thought much of getting a tablet, but after a week or so, I thought that it could be a handy gadget to have around. I thought it would be a bit bigger - as most of the tablets I've seen are 10" units and a 7" unit is a whole lot smaller. It's still a pretty good size to pack around and I like the fact that it weighs in under a pound. Sometimes you don't want to pull out your laptop or if you're going on a trip and don't want to carry too much extra to a meeting or conference, a tablet is handy. I wouldn't commit all my work and assignments to the tablet alone as I will still use my PC and my laptop for my main work, but like I said sometimes nice to curl up on the couch, in the car, flying or anywhere with the Galaxy Tab to play some quick games or even read. 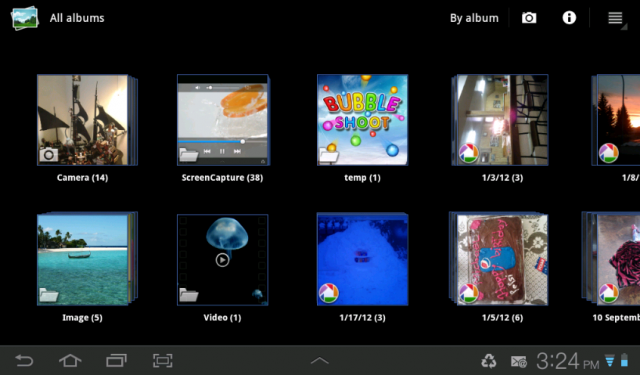 As is typical with Android Tablets, you're able to change and customize your backgrounds with your own pictures. Once you set up your Google Account, it will sync with your Google account. If you don't have one, you can create one on during the initial setup process. Once done, it will pull all your Google pictures and information and contacts that you posted on your Google+ account. It will import the pictures to your gallery. I did notice when you swipe the screen, the app and widget pages are a bit laggy - even with a dual-core processor. They are not as smooth as Ice Cream Sandwich, but it still does the job it's supposed to. Web pages load up nicely and are read-able, tilting it horizontal makes the text scale nicely, but you will have to scroll more. To ease the strain on your eyes you can always zoom in or out, by just simply pinching in or out on the screen or double tapping. 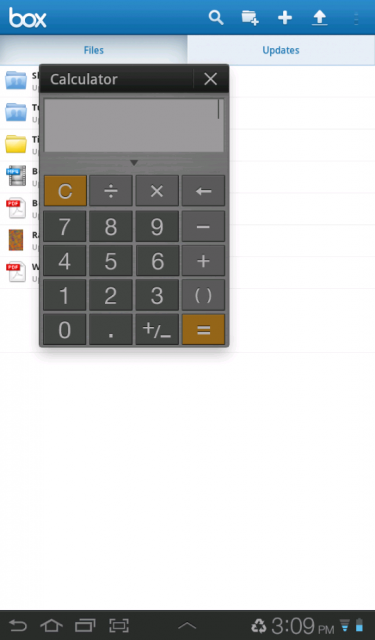 You can adjust brightness, network and other settings such as passwords for your tablet. These are all under "Settings" that you can access by tapping the clock and then you can pull up the appropriate menu that has a settings option. All tablet settings are located here - including quick access to Bluetooth, GPS, WiFi and more. On the next page, we'll continue with testing before we draw up our final thoughts in the conclusion. The Samsung Galaxy Tablet is a solid product that feels well built when you pick it up and handle it. Dropping it is probably not the best idea, but if you did so accidentally I’m sure it could survive a few bumps and bruises. If you decide to sit on it - well, I have no guarantees (Zeus). I haven't played with or tested too many tablets but I am familiar with Android as I have the Nexus S. When it comes to Android, the platform is similar in many ways but Honeycomb is a bit of a different experience. 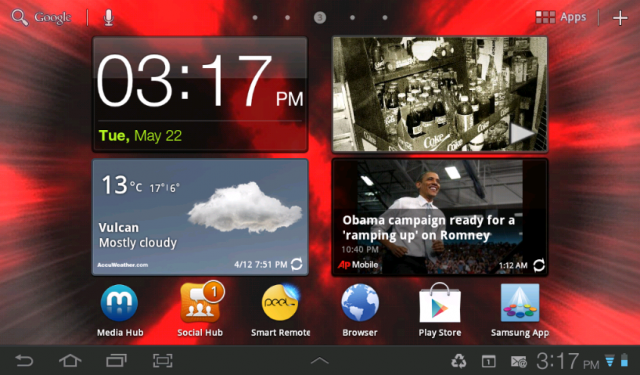 The Samsung Galaxy Tab 7.0 Plus has a nice AMOLED screen. It's not quite as bright and vibrant as the Galaxy Note with it's Super AMOLED HD screen, but the larger screen size makes up for it in my mind. As it was my first and only tablet I played around with for a long period of time, for a tablet it’s not bad other than sliding between app pages are a bit laggy but loading things up runs well and speakers are in a great spot instead of on the backside of the tablet. I didn't have many expectations on performance, but the Galaxy Tab did pretty good in application loading, multitasking and video and audio playback. I like the fact the speaker is on the end of the tablet instead of the back. This makes the volume much louder when using it on your lap. The camera works good - but it won't replace a traditional point-and-shoot. The Galaxy Tab 7.0 Plus has both front and back cameras. Placing apps on the main pages is awesome as the pages are shown in the app library for easy management. When you want to move and place an app, a grid is shown during the move and this helps you get an idea of where you can drop it. The calendar can take a while to sync, but once you get all of your appointments on the tablet, changing a few is pretty speedy. 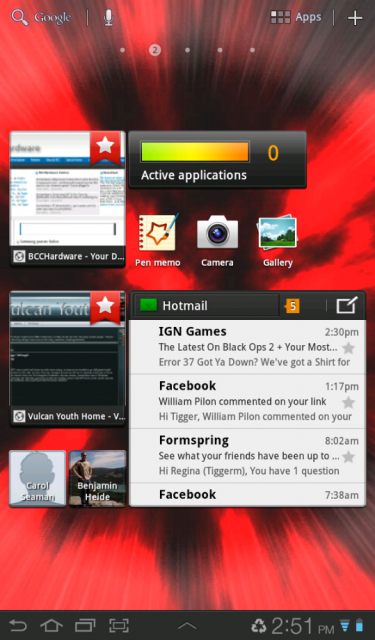 Scrolling through the home-screens wasn't as smooth as I would have hoped, but web pages load quickly and run smoothly. 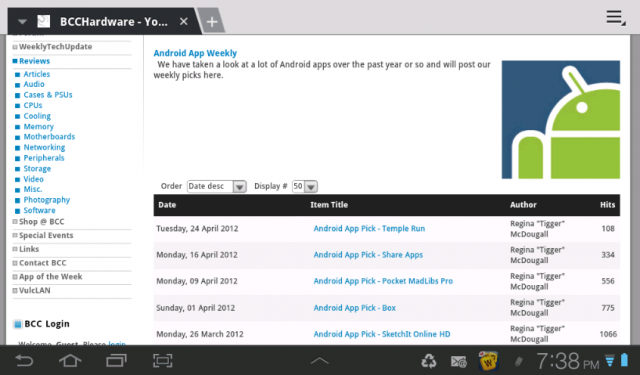 App launching is responsive and social networks load and run quickly. There wasn’t a ton of accessories that came with the Samsung Galaxy Tab 7.0 Plus. Samsung kept it basic with a wall plug and a USB cord to plug into your PC or the wall adapter. They were generous enough to include some earbuds and an owner's manual. I guess the amount of things that came with it makes sense, what more could you have for a tablet? If it came with a case and screen protectors, that would go a long way to impress me. A 16GB microSD card would be awesome to help keep your movie collection all in one place. 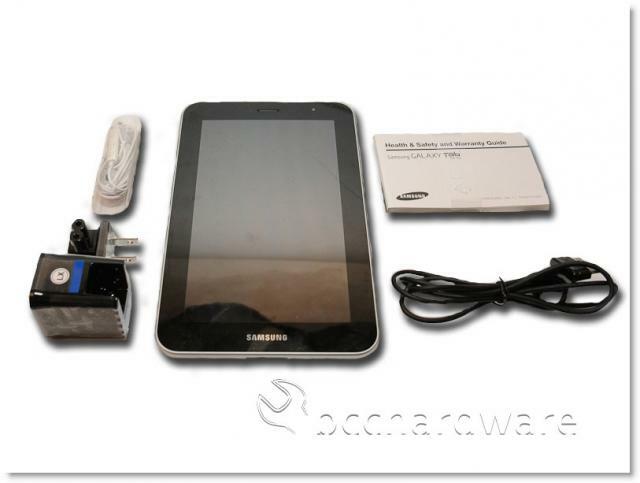 There is nothing to install when you get the Samsung Galaxy Tab 7.0 Plus. If you're using a current operating system, it will automatically detect and install drivers for a USB Storage device so you can copy stuff over to and from the tablet. App installation is painless - just as with any Android product. Although the Galaxy Tab 7.0 Plus is currently running Honeycomb 3.2 - Samsung has stated that it will be getting Ice Cream Sandwich in the first half of 2012 - and time is ticking! When purchasing a product for yourself or someone else, it's always great to know what you're looking for and what is in your budget. Of course you want something that you're not gonna regret buying and return with "buyers remorse". With everything we've written and read about the Samsung Galaxy Tab 7.0 Plus, it looks and work pretty good. A lot of people that saw me using the Samsung Galaxy Tab 7.0 Plus said they would like a tablet about that size as some 10" tablets (and the iPad) are a little large for every situation. MSRP is $349.99 - not a bad price for a dual-core AMOLED WiFi tablet. At $300 for this version, I think they'd sell a lot more of them as an "impulse" buy. I would be willing to spend $349 if it came with ICS and the Super AMOLED HD screen that is on the Galaxy Note. Still, it's a decent tablet with a decent price. A 3G tablet will require a data plan in order to get the most out of the hardware, but this WiFi version won't cost you a monthly fee - that is a bonus in my book. 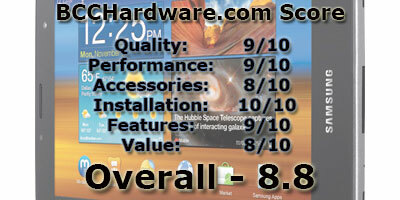 I'd like to thank Samsung for sending us the Galaxy Tab 7.0 Plus to review. This is a great tablet that fits a lot of people's budgets and offers a lot of functionality. Please feel free to post your thoughts, comments and questions in the forum at the "Comments" link below.